And so it happened that at nightfall I found myself yet again in Punta Arenas. Still not quite having found my home there, I tried yet another hostel, this time Manuel's. For $5 I got a good night's sleep and went to one of the dozen or so bus stations in the city and got myself a seat on the next bus to leave for Puerto Natales. The good news was that I did get seat number 1, which offers the absolutely best place to behold the scenery passing by outside the windows, a panorama view to mountains, condors, foxes and nandus. The bad news was that the world's biggest Chilean had annected not only seat number 2 but also more than half of seat number 1. Fortunately, his body fat was a product of US fast food, as he had studied in the USA, so although the trip was a very crowded and sweaty one, at least I did get to learn a lot about Chile from my English-speaking, vertically challenged co-passenger. A three hour squeeze later we rolled into Puerto Natales, a tiny town in the middle of Chile's region XII, Magallanes. I think I found the local YHA/HI hostel affiliate, but it certainly felt more like I was staying in a family's home, with small children running around screaming, fulfilling a sound picture with chattering women and men swearing at a TV showing a football match in the background. For one night it's a very ok place to stay, though. The reason most people have for coming to Puerto Natales is to use it as a springboard to the Parque Nacional Torres del Paine, a most spectacular and unusual part of the Andes. 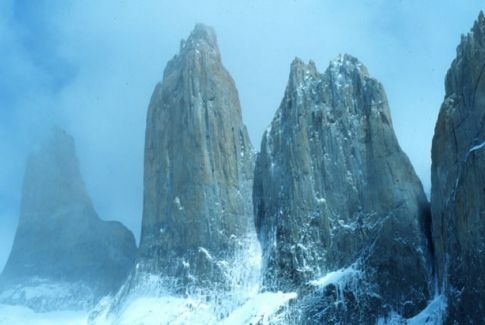 It is sometimes described as South America's Alaska, but if so it is a very miniature version of Alaska. Nevertheless, it is definitely worth a visit: Within a fairly small area you find a number of 2-3000 meter high peaks pointing straight up to the sky from an otherwise fairly flat part of Patagonia, there are glaciers, lakes with the beautiful colours you only get near where ice meets water, there is lots of wildlife in the shape of guanacos (llama-llookalikes), nandus/rheas, condors, rabbits, deer, foxes and even flamingos. So, like all the others that come here, I was eager to get up there. I rented a tent and decided to do "the W", a trek that takes you to all the most scenic parts of the park while avoiding the most strenuous areas. I took my tent to a schoolyard and practiced pitching it, to the amusement of the locals. After a few attempts I felt confident enough to pack the tent onto my backpack and went to the shop to bunker up on chocolate and sausages, the sort of tucker men of the wilderness like to eat when grubs and snakes are not available. At the hostel I spent 30 minutes ignoring the screaming children before I fell asleep, and at 7 in the morning I was in the bus to Torres del Paine. On the bumpy roads around here, the park is about 2 hours away from Puerto Natales, and in addition to a couple of swellings in my head from the bus ride it cost me $16 to enter the park. Included in the fee is the option to ride as much as you like on the park buses to the 3-4 suggested starting points for hikes in the park. I chose to go to Refugio Pudeto at Lago Pehoe, from where there was a boat that, for an additional 15 dollars, took me into a foggy area of the park, so remote from civilization that it was almost impossible to buy a cooled Coke there. Skillfully I pitched my tent at a good site I rented for 2,000 pesos for a night, and hiked up to Lago Grey accompanied by a misty rain and a Coca-Cola that didn't need a cooler to stay nice and icy. After the rather modest glaciers on Tierra del Fuego I was not prepared for the giant one at the northern end of Lago Grey. Glaciar Grey is at least a kilometer wide, originating somewhere a long way further up into the mountains. It was quite scary/awe-inspiring, looking very likely to come rushing down the valley and eat me and my tent sometime during the night, if I didn't behave. It was just me and It, as all the other hikers must have been sitting in their tents, grumbling about the weather. The only other life I saw was a dozen or so condors circling gracefully just above me. The atmosphere and the peaceful sound of nothing was Well worth the 4 hour walk from the camp site. I spent a couple of hours just sitting there, only moving a little bit every now and then to tell the condors to stay off, while I watched both the immense mass of ice in front of me and the more moderate icebergs floating around in the lake. It is amazing what a wide span of colours you get in ice that has had a few thousand years to prepare for visitors. I will not even try to describe the colours here, but please read on, there should be a bit more on this topic in the forthcoming Antartica chapters. On my way back down the sun burned off the clouds, and it turned into a beautiful mid-summer evening in Patagonia. By the time I returned to my tent, the whole "village" was alive, hanging up socks, sleeping bags and Israelis to dry on every tree that could bear it. I was pretty much exhausted and just went down to the lake where I sat down and wrote my diary for the day before I retreated into the tent and fell asleep as night fell, accompanied by the sounds of a camp fire with an international crowd gathered around it, trying to find songs everybody can sing along with, failing badly over and over again. The next morning the weather and everything was just great, except all my clothes were cold and wet, and I won't even mention the icicles in my hiking boots. I changed into all the dry clothes I had left, which left me feeling kind of naked when I started my walk for the day, while the rest of the camp seemed to be still asleep. I walked eastwards on the narrow flat bit of land between the tall Towers of Paine and Lake Nordenskjøld. It was early enough that I startled quite a lots of animals with my fast walk. I did not mean to scare them, but I really had to keep up the pace in order to stay warm, which worked well until I got tired and discovered that now ALL my clothes were wet, which I could not really understand, because it wasn't raining, and I certainly do not sweat that badly. Or maybe I do. Anyway, I stopped and dried up in the sun for a while, feeling very happy, except I discovered upon removal of my socks that half of my little toe had become missing in action. I patched it up with Compeed and walked on, telling myself and the vultures circling over my head that this was no problem, or at least only a minor one. Two hours after leaving Refugio Pudeto I arrived at Campamento Italiano, a good shelter inside a small forest where it's actually free to pitch a tent and stay. I left my stuff here and walked up the Valle del Frances ("the Valley of the river Frances"). It's a very nice walk, a quick climb all the way for an hour or so, and if you're there early enough in the day, you will have sun and a very impressive view towards the glaciers in the valley. Every now and then I heard thunder-like sounds that weren't from thunder but from huge chunks of ice falling off from the glacier-front and down on the other side of the valley. Magnificent. When I later walked further east along the lake Nordenskjøld it started clouding over again, and I was very happy to arrive at the Estancia de las Torres camp site five hours later, where it is possible to have a fairly warm shower. My toe was still missing, and I could not see the actual mountains at all, so I just positioned my tent so that I could lie down inside, reading and looking towards the mountains, waiting for the mountains to return into view. Nothing much happened for the rest of that day, except two Chilean families settled nearby in the Mother of All Tents, enough to house at least a two-ring circus inside. They did not completely block my view, so that was okay, and it turned even more okay when they actually put up a whole asado, a huge open-fire grill, and invited me to consume with them the sheep they had brought and prepared over the fire. For a couple of hours I forgot about the mountains, and even almost about my lack of toes as well. And then it was dark. On my third day in the park I awoke to a postcard view towards the Torres del Paine, and was so happy about that that I accepted that because of my missing toe I was not able to actually walk closer up to them. Instead I hobbled around in the woods at the foot of the mountain, finding comfort in the fact that in about a week I would be on my way to Antarctica and even greater scenery. Back in Puerto Natales my thinking about Antarctica was much enhanced when I met two men from Santiago who, of course, were in Puerto Natales just so they could go to Torres del Paine as soon as possible, and one of them had served in the Chilean navy, where he spent a whole summer on a ship running supplies to the Antarctic research stations. He gave me a long lecture on how whales are more likely to come close to the ship and easier to spot in the mornings and whenever the ship is not moving, he talked with great fondness about going for a swim on some weird island that really is just the top of a volcano, and he confessed that in Antarctica he had actually become friends with an Argentinian, something that was not likely to happen anywhere else, which to him was the ultimate proof that Antarctica is a really special place. After my endeavours in the beautiful and oh-so-wet mountains my backpack and my clothes had acquired a rather peculiar smell, bordering to a stench, so I did not dare spend more than one night in the same room as Chilean ex-marines. 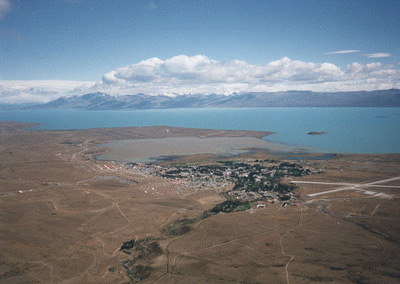 I got a 13,000 pesos bus ticket to El Calafate in Argentina, from where I had a flight to Ushuaia booked just in time for the departure for Antarctica. The YHA hostel in El Calafate is way above average, with all the facilities a trekker could wish for. I checked in and immediately did my laundry by hand in the laundry sink, and afterwards took everything outside to dry. The sun was really intense and the whole area looks like a desert, except for the large lake and the snow-capped mountains around it, so everything was dry and smelling nice in less than an hour. Unfortunately, being clean and dry and not foul-smelling again made me notice that I was actually the only one at the hostel to be in that condition. Almost all the others, except for Daniel, who I miraculously bumped into yet again here, that were sitting around in the hostel lounge were bearded men in thick, well-worn and seldom-washed woolen sweaters, and they all sat silent with a look in their eyes like that of caged, big animals; showing a deep desire to be out there somewhere instead of in this cramped little room. I realized that toe or no toe, there was probably nothing else to do to pass the time around here but to go trekking, and that I could go easy on the deodorant if I should choose to. Somehow I found that acceptable. It turned out I did not have to worry too much about how to pass the time in El Calafate. I am not sure exactly why I got sick, but I definitely did. The lessons I think I learned were: 1. Never eat peaches in Argentina!, 2. Never eat peaches in Argentina! and 3. Never eat peaches in Argentina. Or make sure they have been thoroughly washed first, anyway. Still, there could be another explanation, as on my first day in El Calafate I did a day-trek to a peak behind the hostel, from which this picture was taken. It was a fairly easy climb, at least going up, and the views from up there were really great, only diminished a little bit by an incredibly strong wind, so that I had to stay off the edges of the mountain. On my way back down the steep mountain-side I had a bit more trouble. Because of the dry, rocky/sandy conditions, I kept almost falling down, and had to hold onto the vegetation to stay on my feet. Only problem was that the vegetation was all cacti and spiky grass, so that soon my hands were full of bleeding scratches, and it is fairly believable that plant poison made its way into my body that way. Anyway, I got back to the hostel and it took a couple of hours before I noticed I had a really bad headache, felt like vomiting and at the same time almost could not move my body because it would rather sleep. I was happy to learn that the two poor souls that had to share a room with me both were almost graduated medical doctors from New York. They were only slightly annoyed by me dragging them away from their newfound, female friends from Chile, and gave me a quick examination that resulted in the diagnosis that I would probably live through this. Either food poisoning, some other poisoning or Dengue fever, they said. Or a tumor in my brain. Or possibly something else. And they had only nine days in which to do Brazil, Argentina and Chile the American way, so if I would just go to sleep, please, so that they could go back out to their amigas, they promised they would check on me in the morning. I certainly was not in a condition to join them, so I just drifted out of consciousness, but I remember they had really huge eyeballs, and that they were taking coffeine pills in order to avoid having to sleep throughout their tour. I'm not sure whether they checked on me in the morning or not, but when I finally woke the next day, they had been replaced by a German couple, Berit and Jens. They both seemed a little bit surprised to find someone sleeping when they checked in in the middle of the day. Theirwondering increased throughout the day as I kept staying in bed all day, sleeping and murmuring something about being fine every time they came into the room to get something or leave something. It was rather obvious they suspected that I was just having a major hangover after having consumed infinite amounts of alcohol, so I really did not sense any sympathy or concern beaming off them. In the evening I had gathered enough strength to go to the lounge and stay in an upright position for a while, and through my drousiness I gathered that due to a coincidence of cosmical proportions, Berit and Jens were going to Antarctica on the very same boat I was booked onto. As we realized that this meant we would soon be spending quite a bit of time together contrained within the hull of a Russian ship, we suddenly all were good friends. I admitted I was not feeling too good, and as they left for a daytrip to the glacier Perito Moreno the next day, they left me with their Lonely Planet Antarctica guide as company. My day was spent partially tanning on the hostel lawn, reading about the great adventures that have taken place on Antarctica, partially on the toilet, and partially running in between the two said locations. For being so sick, it was quite a good day. The only thing that worried me was that according to Lonely Planet, Japanese, Swedish and Norwegian citizens are required to have a permission from their governments in order to enter the Antarctic mainland. I decided to not tell anyone about this. If you are a Norwegian planning an expedition and want to do everything by the book, have a look at the Norwegian Polar Institute's Web site at least a year before you want to get going. 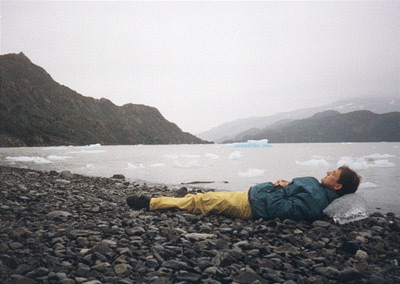 The next day was even better, as I managed to stagger, with my 3/4 functional toe, down to Laguna Nimes, an appendix to the large Lago Argentino, where I sat for a long time, watching swans, flamingos and other birds in the wild, while concentrating on not thinking about having to go the bathroom. I met a couple of Canadian bird-watchers who with great enthusiasm and binoculars pointed out to me the only two-coloured swans in the world. "Yay! ", I said, and they seemed happy about that. Back at the hostel the Germans had been replaced by a Swedish girl called Linda and a Swiss girl whose parents agreed with tradition and therefore named their daughter Heidi. She had arrived in South America on a container ship, paying US$1,300 for the pleasure of spending three weeks onboard the ship covering the distance from Italy to Buenos Aires with short stops in Spain and Brazil, having unlimited access to fresh air and a video library, her own little bedroom, living room and bathroom. The crew was also nice enough to make her a small swimmingpool out of one of the containers. I had dinner with them, and was very happy when my fried chicken came through the system and out again in a civilized manner. I was ready to return to Ushuaia.